Jobu discusses the magical season being put together by Wladimir Balentien of the Tokyo Yakult Swallows of the Nippon Professional Baseball League in Japan. For those of you who don’t follow Japanese baseball, you’re missing something very special going on in Tokyo. 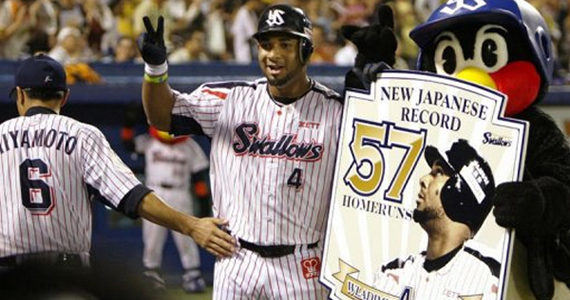 A couple of weeks ago, Yakult Swallows slugger (and former Major League bust) Wladimir Balentien swatted his 56th and 57th home runs in a game, which broke the Japanese single-season home run record previously owned by legendary slugger Sadaharu Oh. It was a feat no one thought would ever be achieved, and Balentien still has time to add to his total. Just who is this man and why is he in Japan and not here? Let’s find out. The 29-year old was born in Willemstad, Curaçao on July 2nd, 1984. When he was 16, he was signed by the Seattle Mariners and began his professional career. While at times his effort may have been questioned (he was benched for lack of hustle a few times)a, his power was never in doubt, and he was viewed as a big part of the Mariners’ future. As soon as he got stateside, he started hitting the ball over the fence, racking up 16 homers in 50 games in Rookie Ball. The next year he hit 17 homers while stealing 11 bases. Over the next few years, he topped 20 homers at every level of the organization as he climbed his way to the big leagues. 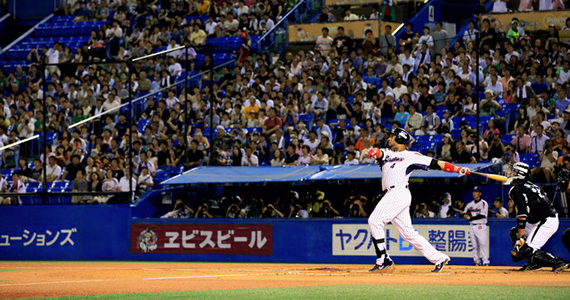 He even impressed with two doubles for the International Team in the 2007 All-Star Futures Game. It seemed the Mariners really had something in Wladimir. His big league debut came in that 2007 season, but he only played in four games, and only got up to the plate 3 times as a September call-up. Appropriately enough, he homered in his third and final at-bat, a pinch-hit bomb off of Roberto Hernández (aka Fausto Carmona). 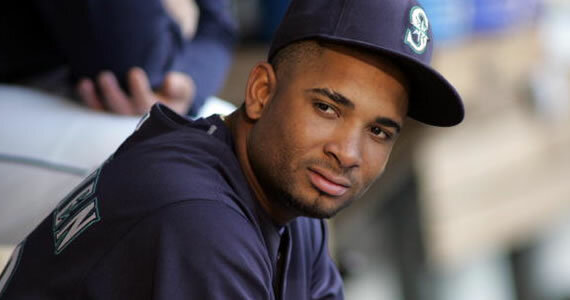 Although he began 2008 in the minors, he eventually joined the Mariners, which is where he spent most of the season. He struggled, hitting .202/.250/.342 with only 7 HR in 71 games. In 2009, he suffered through another struggling season, hitting .234/.305/.385 with only 7 HR in 96 games. He was also traded to the Cincinnati Reds for pitcher Rober Manuel. He did manage to hit a 495-foot home run while he was in Cinci, but he spent all of 2010 in the minors before heading East… Far East. Like many other “4A” (too good for AAA, not good enough for MLB), Balentien decided to try to make himself a star in Japan. He signed with the Tokyo Yakult Swallows in 2010 and started making a late bloomer out of himself. 2011, his first year in Japan, was a bit of a struggle for Wlad. He hit 31 homers, but only managed a .228 average. Last year, he again hit 31 homers, but this time he hit .272, which made him less of a one-dimensional threat. Despite that improvement, I don’t think anyone saw 2013 coming. First of all, Balentien missed the first 12 games of the year with a leg injury he suffered while representing the Netherlands in the World Baseball Classic. Once he got back, he started crushing baseballs. Through 124 games at press time, he now has 58 home runs, 127 RBI, and is hitting .333. By the time all is said and done, he might double his previous single-season best AND his Japanese career total in one season (his high is 31, his total is 62)! The average is higher than anything he’s ever sniffed, even in the minors. He has really turned himself into an offensive juggernaut this season, and it’s pretty amazing. This home run record chase has not come without controversy, however. First of all, and let’s just get this out of the way, it’s not very often that a 29 year old suddenly becomes the biggest power threat in baseball. It’s been done before (José Bautista comes to mind), but that steroids monster will always loom over a guy like this. As of right now, there’s no evidence that Balentien has done anything wrong, so let’s hope that holds true. Secondly, league officials admitted this year that a livelier ball was used (without team and player knowledge) in order to boost offense. After all, chicks dig the long ball. This may be contributing to Balentien’s season, but you’d think someone else might be in the chase too, no? Remember Mark McGwire and Sammy Sosa? If only one guy is really making this kind of run, it becomes harder to blame a juiced up baseball. Finally, there’s the previous record owner Sadaharu Oh. Oh hit his 55 home runs 49 years ago, but his record needed a lot of help to stay a record. There have been other challengers before Balentien. In 1985, Randy Bass ended his season with 54 homers and was walked intentionally during his last at bat. In 2001 Karl “Tuffy” Rhodes ended up with 55, and he was systematically intentionally walked over the last three of games of the season. The same thing happened to Alex Cabrera in 2002. Prejudice against foreign players, and the fact that Oh is such a cult hero in Japan (and managed the teams that Rhodes and Cabrera were facing) led to those guys being robbed of their chance to break the record. Nowadays, attitudes toward foreign players have definitely changed, but I think that the fact that Balentien had so much time left to play also helped. You can’t walk a guy every at bat for three weeks, can you? Either way, no one stands in Balentien’s way of the record anymore. It’s his, and his alone. and I’m curious to see how many he ends up with. Will he top 60? I don’t care what league you play in. If you hit 60 homers somewhere, you should probably be on a Major League roster. As of right now, Balentien has a three-year deal with no opt out clause, so I’m not sure we’ll be seeing him stateside any time soon. If he wants to leave, the Swallows might not let him, but he’s making great money and might not want to leave anyway. Why go be just another guy in America, when you can be the best home run hitter ever in Japan? Either way, he will definitely be an intriguing player if he gets the chance to come on over. Sure, he failed once in MLB already, but so did Cecil Fielder. Big Cecil came back from his season in Japan and hit 51 home runs in 1990. I guess we’ll find out if Balentien ever earns another shot in the bigs eventually, but for now let’s just sit back and enjoy the magical season he has put together.